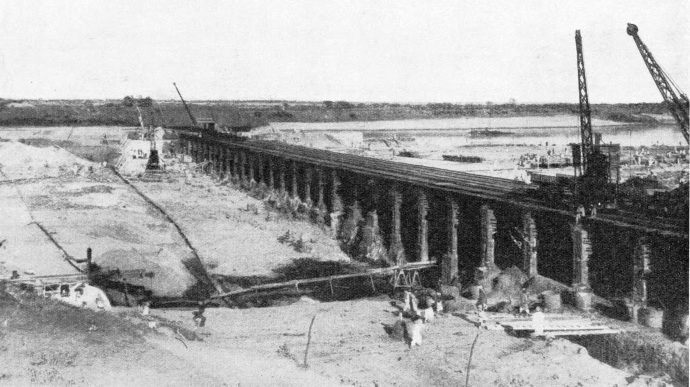 THE TEMPORARY GANTRY or bridge on the site of the Sennar Dam was built of massive timbers carried on piles. The bases or piers were built of brick and concrete to withstand the weight of trains and travelling cranes. Three sets of rails were laid along the gantry so that locomotives could haul trucks, each loaded with 40 tons of stone, fro the masonry of the dam. The cranes raised the excavated material from the bed of the rive and handled the stones for the building of the dam. THE Anglo-Egyptian Sudan, a vast tract of territory with an area of 969,600 square miles, is nearly as large as British India. Lying to the south of Egypt, the Sudan has been the scene of many triumphs on the part of the British engineer. When the country was taken over by Great Britain and Egypt after the defeat of the Dervishes in 1898, it was for the most part an inhospitable desert, sparsely populated by wandering tribes. The work of the civil engineer has been largely responsible for its transformation in little more than a generation from a backward and poverty-stricken land into one of prosperity and contentment. Cities and thriving settlements with public buildings and schools have been founded; over 2,000 miles of railways and nearly 6,000 miles of telegraph lines have been built. A modern port has been built on the Red Sea. Rivers have been bridged and upon them has been placed a fleet of steamers and other craft for transport purposes. 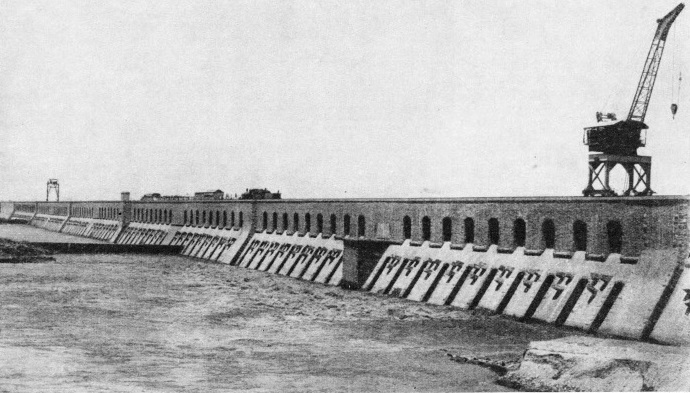 The most notable feat of the engineer in the Sudan is the building of the Sennar Dam across the Blue Nile, to the south of Khartoum, the town in which General Gordon was killed in 1885. Nearly two miles in total length, the Sennar Dam is one of the world’s great barrages. It has been the means of reclaiming hundreds of thousands of acres of parched land. On this reclaimed land rich crops of cotton are now cultivated. The building of a great retaining wall across a refractory river in a hot, desert country far from the centres of civilization called for high organizing skill. There were fights with floods, and work was temporarily held up by the war of 1914-18 and hindered by malaria and other circumstances. The undertaking was not without its political significance. Egypt claims the right to control the waters of the Nile. As she is virtually a rainless country, her crops of cotton, sugar cane, rice, wheat and millet are all grown on irrigated land. Hence she considers that she has an established right not only to the waters but also to the fertilizing silt that these waters carry with them (see the chapter “The Nile under Control”, which begins on page 146). Thus any proposal for using the Nile waters to irrigate lands on the banks of the Upper Nile in the Sudan had to be so framed that these historic claims were not endangered. The people of Egypt are fully alive to the situation, and they have claimed to be allowed to control the Sudan itself. An equitable arrangement has been made, however, and there is sufficient water in the Nile to supply the requirements of the Sudan as well as those of Egypt. IN THE MAIN CHANNEL cofferdams, known as sudds, were built to divert the river into the western channel while foundations were laid. The main, or eastern channel of the river was 700 feet wide and was separated from the western channel by a small island. This width had to be excavated, the foundations laid and the dam built to a height of 87 feet in nine months. It was a race against the approaching floods. After the conquest of the Sudan considerable thought was given to the problem of irrigating areas in the Upper Nile country without endangering the claims of the Egyptians lower down the river. With this object in view, it was decided that the great Plain of Gezira was a suitable area. The plain, which lies in the fork formed by the Blue Nile and the White Nile, is located upstream beyond Khartoum. Khartoum lies at the confluence of the two rivers. The country within the fork had hitherto been little better than a desert area, and nothing had been grown on it except some millet, and even then, at the best, the crop was uncertain and was entirely dependent upon the tropical rains. It was proposed to irrigate a part of this area. If the soil was found to be suitable for the cultivation of cotton, the crops would handsomely supplement the supplies received by the cotton mills of Lancashire from other parts of the world. 800,000 acres, of which nearly one quarter was devoted annually to the cultivation of cotton. The plan having been approved, it was decided to obtain the necessary water by damming the Blue Nile. It is not always possible to build a dam at a given spot. Many points have to be taken into consideration - the nature of the bed of the stream, its distance from the area to be irrigated, the general lie of the land, the available labour and the supply of the necessary material. The most suitable site was decided to be near Sennar, at Makwar, at that time an insignificant little village, 170 miles south of Khartoum. At Makwar the river was divided in its course by a small island, which aided the engineers immensely, enabling them to deal with one section of the stream at a time. Furthermore, at this point a ridge of hard rock crossed the course of the river at no great depth below the surface, and this was chosen for the building of the foundations. Work upon the dam was begun in the spring of 1914. Houses for the staff and workmen, stores and workshops were built, plant and other equipment were bought and staff were engaged. Scarcely had the engineers and their men settled down to the task when the war of 1914-18 broke out and the works closed down. They were reopened in 1919, the contractors being the Sudan Construction Company, working on a percentage basis; that is, the contract was governed by the prices ruling for raw material and the like. The Construction Company carried on the work until 1921. By that time prices had increased all round and the authorities found that the estimated cost of the scheme would be considerably exceeded. When it was realized that it would be impossible to complete the undertaking with the available funds, the work was stopped for the second time. 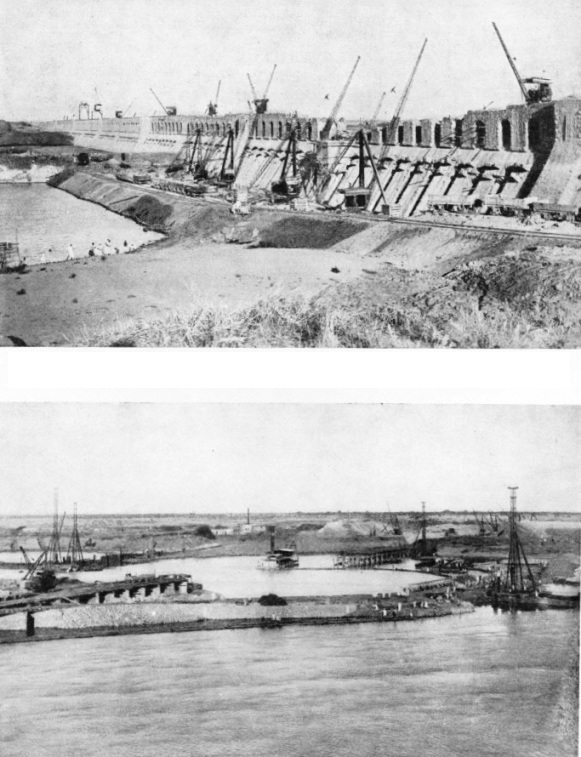 In 1922 further funds were obtained and six British firms were invited to submit tenders to complete the dam and to build the canal system in connexion with it, the tenders to be on a fixed-rate basis. 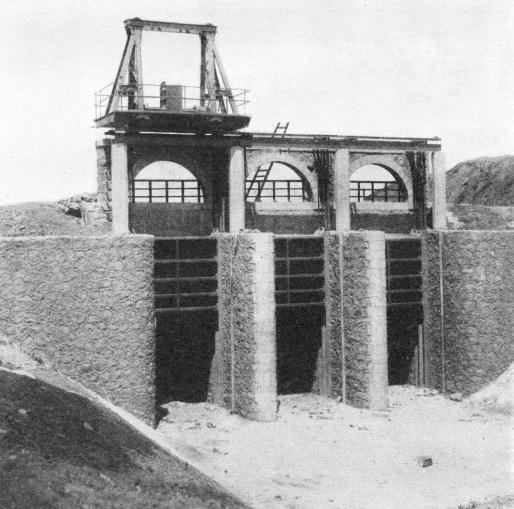 S. Pearson & Sons, Ltd, of London, were successful, and the authorities accepted their contract to complete the dam by July 1925. The contract was signed in July 1922, and work was begun in the following December. The dam was finished two months before the expiration of the estimated time-limit, and the canals were completed a month later. All told, the dam and its canals called for an expenditure of £8,600,000. Advantage was taken of the small island in laying down the foundations. This work could be carried out only when the river was at its lowest. The smaller or western arm of the river, that portion flowing between the island and the western bank, was dealt with first. The flow of the river was diverted into the main or eastern channel by cofferdams or “sudds”, one built upstream and the other downstream. The water within this sudd area was then pumped out and work on the foundation site was begun. The floating masses of matted vegetable growth common in the River Nile are also known as sudd. THE PLAIN OF GEZIRA is situated between the Blue Nile and the White Nile above their confluence at Khartoum. To irrigate this area of parched land a dam was built across the Blue Nile at Makwar, near Sennar. The first area to be irrigated was a tract of 300,000 acres in the neighbourhood of Wad Medani. By 1936 the area irrigated amounted to 800,000 acres. Hundreds of men were set to work to dig out the river bed, and it was necessary to go down to the solid rock. This was at a low level, in one place as much as 66 feet below the lowest summer water level in the river out-side the sudds. Then, along the site of the dam, a temporary wooden bridge or gantry was built. It consisted of massive timbers carried on a forest of stout piles. Because of the enormous weight which the gantry had to carry, it was necessary to build special substantial brick and concrete bases. The gantry carried three lines of rails, along which locomotives hauled trucks, each loaded up to 40 tons with stone. Upon the rails, too, ran cranes by which the excavated material was raised and the stone lowered for the building of the great retaining wall. Securing the foundations for the eastern or main channel was a daring piece of work. This section of the river was 700 feet in width. It was the desire of the engineers to avoid, if possible, the “resudding” of the channel another season. To accomplish this they had to divert the flow of the stream to the western channel, excavate the bed of the river for foundations, and build up the dam to such a height in one season that it would be above the next year’s low river level. Only nine months were available to carry out all this work. The Blue Nile rises in the mountains of Abyssinia, and during the rainy season, which lasts many months, the flood waters pour down from Abyssinia, with enormous and apparently uncontrollable force. Could the second half of the dam be raised before the arrival of the floods? The engineers made their calculations, and declared that it could be done, although no one could tell within a week or two when the floods would come. First came the blocking of the channel by sudds. They were formed by interlocking steel sheet piling driven into the bed of the river and strengthened with banks of earth and stone placed against their sides. In the previous season 111 piles had been driven along the centre line of the upstream sudd and seventy-nine along the line of the downstream sudd. The piles ranged from 12 feet to 87 feet in length and were driven by four piledrivers. BUILDING THE SUDDS OR COFFERDAMS for the foundations of the Sennar Dam was done by driving interlocking steel sheet piling into the bed of the river. This was then strengthened with banks of earth and stones. The piles ranged from 12 feet to 87 feet in length and 111 piles were driven along the centre line of the upstream sudd. The flood that year scoured out the piles in the upstream sudd, which were afterwards found to be lying on the top of the rock under the sand of the river bed, and above the point where they had been driven. The flood also removed seven of the piles in the downstream sudd. It was decided not to replace these piles, and this section of the sudd was formed by dumping earth and stone upon the silty sand of the river bed. After the flood waters had subsided, the engineers began their task of building the dam across the eastern channel before the floods were due again. Without delay the remaining piles were driven, 237 in the upstream and 420 in the downstream sudd. Now came the work of closing the sudds. This is often a tricky job and the operations have to be handled carefully. The original intention was to close the north sudd first and for this reason several of the piles had been fitted with sluices. Because, however, of the depth of the water, the low level of the surface of the rock, and the swiftness of the stream as the gap in the piles became narrower, great difficulty was experienced in continuing the work. There wias danger that the sand of the river bed would be washed away as the gap became smaller. At the south sudd the water was not so deep and the rock lev el was higher. It was therefore decided to close this sudd first, and the piling was advanced from both ends until the gap was 130 feet wide. Bags of earth were thrown on either side of the driven piles to protect them from scour. A large steel barge was then anchored across the gap, and truck loads of stone were thrown from it directly into the river above the barge until the gap had been closed. Piles were then driven in front of the stone across the gap. To strengthen the sudd still more, an 18-in suction dredger removed the sand and silt from the top of the rock within the sudd, and pumped it on either side of the wall of the sudd. MECHANICAL EXCAVATORS at work on the branch canals of the Sudan irrigation system. From the main canal, which is 70 miles long, 500 miles of branch canals radiate. If the excavated material had been made into bricks, there would have been enough bricks to build a wall 1 foot thick and 5 feet high round the earth at the Equator. Then came the closing of the north sudd. The materials used in building the sudds included 70,000 cubic yards of decomposed gabbro rock and ironstone conglomerate, 5,425,000 sandbags filled with earth, 41,200 cubic yards of granite rubble and 785,400 cubic yards of sand and silt pumped by dredgers. As soon as the sudds had been closed the water was pumped out and work began upon the foundations. To remove the water within the sudds twenty 12-in centrifugal pumps mounted on barges were used. Six of these were driven electrically from a power station on the east bank of the river; the remainder were worked by semi-diesel engines on the barges. The leakage through the sudds was easily dealt with by these pumps, which assured a dry bed while the foundations were being obtained. The dam is founded upon sound gabbro rock, which is of igneous origin and has a high specific gravity. Above this sound rock was a stratum of decomposed gabbro. The decomposition had taken place along joints, so that the rock was reduced first to a mass of boulders with decomposed material between them. In the upper parts, where the process was complete, the rock was entirely decomposed. Above this decomposed gabbro, in some places, there was a layer of ironstone conglomerate, in others the decomposed gabbro was covered by the river alluvium. Considerable excavation work was therefore necessary before solid rock for the foundations could be reached. The average level of the foundations proved to be above the estimate. Springs were encountered in the foundations. In all 182 were dealt with, but none discharged any large quantity of water. They issued from joints between boulders of sound gabbro; and in no instance could they have exerted more than a purely local pressure on the masonry of the dam. It was desirable, however, to seal them. The usual method was to build the masonry round the spring and so form a well, in which the water was kept below the level of the top of the surrounding masonry by pumping. When the water level was steady, the well was pumped out and cleared, and a depth of dry rubble amounting to 5 feet was thrown into it. In this rubble two vertical iron pipes of 3 in or 4 in diameter were placed, their lower ends being at different levels. These pipes were continued up above the level of the surrounding masonry. Masonry was then built above the dry rubble to the top of the well. When this had set, the well was grouted with neat Portland cement, which was forced down one pipe until it appeared at the top of the other. The top of the second pipe was then capped, and an air-compressor forced grout down the first pipe under pressure up to 25 lb per square inch, until no further grout could be introduced. The compressor was used also at the beginning of the grouting to clear out as much water as possible from the bottom of the well. The foundations having been secured, work upon the dam was pushed forward with all speed. At its base the dam has a width of 90 feet. From the lowest point of the foundations it was necessary to build up the dam to a height of 87 feet before the rising of the flood stopped the work. For three months 300 masons were employed in two shifts, work proceeding continuously from 5.30 am till 12.30 am. Large electric flood lights were attached to the gantry upstream of the dam to enable the work to be carried on at night. The engineers were racing against the approaching flood. Up to 1,300 cubic yards of masonry were built daily. In that anxious season over 130,000 cubic yards of masonry were laid in the main channel alone. So the great wall rose; and when it had reached the desired height, preparations were made for removing the cranes and other heavy machinery from the gantry and the downstream sudd. This accomplished, the gantry was taken down. Scarcely had this been done when the river rose above the site. But the engineers had won. The dam is of uncoursed granite rubble set in cement. The granite for the rubble came from a granite hill thirty miles away, rising from the plain to a height of 500 feet. Here quarries were established, and an army of masons was continually working, blasting and hewing the stone, sending 2,000 tons a day down to the site of the dam. The cement used was made on the spot. Good limestone and clay for its manufacture were available. The cement factory which was established was capable of turning out more than 1,000 tons of cement a week. Plenty of sand was to be had from the river for mixing with the cement to make cement mortar. For the greater part of the work a special red cement was used. This was made by grinding together seventy parts of Portland cement clinker with thirty parts of burnt clay. The mortar made from this cement was found to be as strong and serviceable as if it had been made only with pure Portland cement. When the work was in full swing 20,000 men were engaged upon it. Some of these men worked on the masonry, others were employed on digging the canals. About one half of the men were Sudanese and the other half Egyptians, although the granite ashlar blocks were cut by Italians. The native workmen mostly lived in masonry “tukhls” - circular buildings with conical roofs similar to the timber and grass huts used by the natives of the Sudan. The Egyptian workmen were subject to malaria and, because of this, special precautions had to be taken to prevent the spread of the disease. During the three months when the mosquito was most prevalent, work was reduced to a minimum. The breeding places of the mosquito were attacked and as many of the larvae of the insects as possible were destroyed with paraffin. Fortunately, this season occurred when the water level was high and not much work would have been possible in any event. The heat was trying, the average daily maximum temperature in the shade for the whole year being 100° Fahrenheit. The dam has a total length of 9,925 feet, 4,600 feet of which consist of earth embankments with masonry core walls. The maximum height above foundation level is 130 feet. The greatest width at the bottom is 90 feet. The dam gradually tapers to a width of 23 feet at the top, over which the railway runs. About 15,000,000 cubic feet of masonry and 70,000 tons of cement were required for the dam. The total weight of the structure is 1,000,000 tons. The flow of the stream is controlled by eighty sluices, and these and the spillway openings are lined with granite ashlar. The sluices in the central section of the dam are closed by special gates, weighing tons each. These are housed in heavy cast-iron frames. REGULATORS IN THE MAIN CANAL of the irrigation system of the Gezira Plain control the flow of water to the branch and subsidiary irrigation canals. 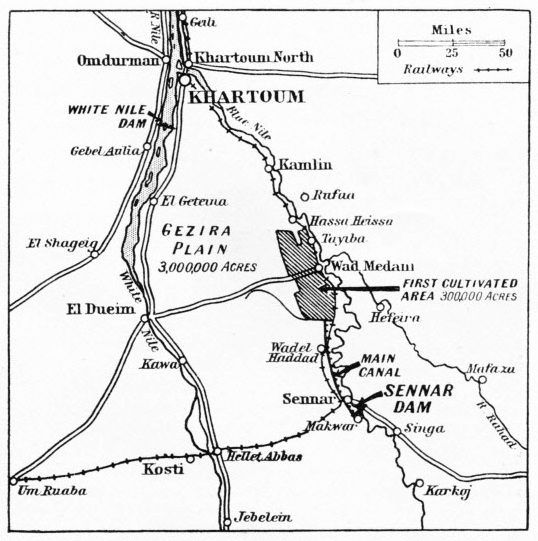 It was to supply water for the irrigation of the Sudan that the huge Sennar Dam was built. The excavation of the canal system was in itself an enormous task. 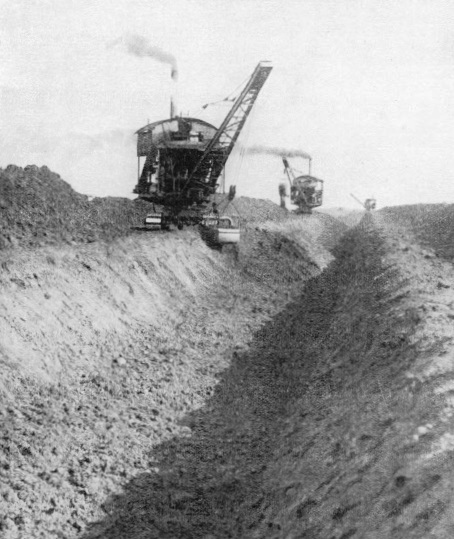 More than 20,000,000 cubic yards of material were excavated, mainly by dragline excavators such as that illustrated above. The gates are raised by two petrol-driven cranes that travel along rails laid on the copings of the parapet wall. One is of the travelling jib type, the other a modified form of travelling gantry crane. The particular advantage of the jib crane is that it enables the gates to be lifted completely out of their frames and placed on trucks when it is necessary to examine or paint them. Any of the sluices and gates may be examined on the spot by lowering a heavy steel shield in front of the upstream sluice opening. In addition to the sluices, there are forty large spillway openings, measuring about 16½ feet in width and 6½ feet in height. The seventy-two smaller openings measure about 9½ feet by 6½ feet. When in maximum flood the Blue Nile has been found to discharge 353,000 cubic feet of water a second. In the design of the dam a good margin has been allowed for abnormal floods, the spillways and sluices combined being designed to pass a flow of 530,000 cubic feet a second. THE SENNAR DAM NEARING COMPLETION. The dam has a total length of 9,925 feet, of which 4,600 feet consist of earth embankments with masonry core walls. The maximum height of the dam above the level of the foundations is 130 feet, and the greatest width at the bottom is 90 feet. The dam tapers to a width of 23 feet on the crest. A railway line has been laid along the top. The total weight of the structure is 1,000,000 tons. The flow of the stream is controlled by eighty sluices. CLOSING THE UPSTREAM SUDD of the deep channel on December 19, 1923. The materials used in building the sudds included 70,000 cubic yards of rock and conglomerate, 5,425,000 sandbags filled with earth, 41,200 cubic yards of granite rubble and 785,400 cubic yards of sand and silt pumped by dredgers. There are no locks. As the Blue Nile is navigable only for a few months during the season of flood and native sailing-boat traffic on the river is small, locks were not considered necessary. The dam has caused the formation of a lake two miles wide at the dam, and nearly 100 miles long. The quantity of water thus impounded amounts to 22,400,000,000 cubic feet. The use of this water will not injure Egypt in any way, as it will be taken at that season of the year when it is not required by Egypt and if not so used would run into the Mediterranean to waste. An interesting experiment has been made with the dam. A series of steel cylinders has been built into the structure at various points. These cylinders have been connected by wires to electric meters, which will measure the pressure that occurs. At one foot from the surface, in a large body of water, such as that held in check by the great dams, the pressure has been estimated at 62 lb to the square foot; at a depth of 10 feet the force would be 620 lb, and at a depth of 100 feet no less than 6,200 lb to the square foot. The results should be of supreme interest to irrigation engineers the world over. The canal system that carries the water from the lake to the desert area to be irrigated consists of a main canal seventy miles in length and over 500 miles of branch canals. From these branch canals there radiate small field channels, bringing the total length of canalization to over 1,500 miles. The main canal has a bed width of 130 feet, a depth of 10½ feet and a capacity of 150 cubic yards of water a second. there would have been enough bricks to build a wall 5 feet high and 1 foot thick completely round the earth at the Equator. Some 800,000 acres have been reclaimed, upon which valuable crops of cotton are being reaped, as well as cereals and other produce. Thus did the engineer win a great victory in the desert regions of the Sudan. The works were designed by Sir Murdoch Macdonald when he was Adviser to the Egyptian Government Public Works Ministry. The engineer in charge of the works was Mr. O. L. Prowde, MICE, to whom the writer is indebted for assistance in the preparation of this chapter. 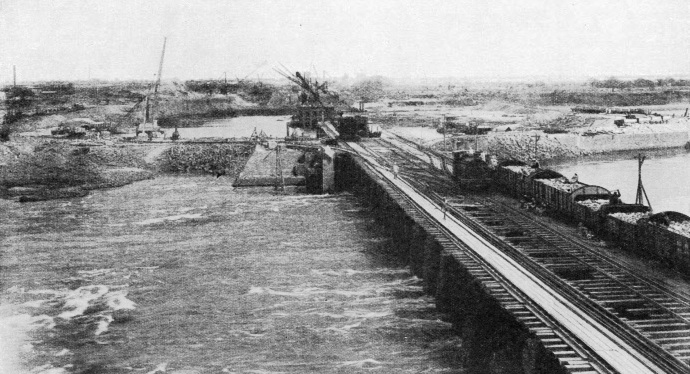 TWO PETROL-DRIVEN CRANES, one of the travelling portal jib type (right), the other a modified form of travelling gantry crane (left), run on rails laid on the crest of the Sennar Dam to lift the sluice gates. This photograph shows the first railway train going along the dam on June 24, 1925. You can read more on “Fighting Famine in India”, “Fighting the Drought Menace” and “The Nile Under Control” on this website.